This sofa is your home’s fashion wonder. Velvet microfiber fabric is on trend and elevates your space with luxurious texture. Plush cushions make it a pleasure to sit. 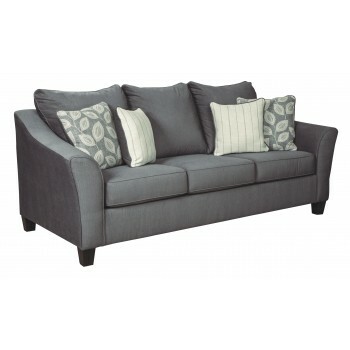 Casual contemporary flare arms invigorate this style with a comfortable place to rest your arm. Accented with linen-look stripe and abstract vine pattern throw pillows to lighten the look.